Romana Schmalisch studied Fine Arts at the University of the Arts in Berlin. She was a resident artist in several stipend programs, among others as a researcher at the Fine Art Department of Jan-Van-Eyck Academy, Maastricht, and in the Berlin Senate's stipend program in London. Robert Schlicht studied philosohpy at Humboldt University Berlin. Together they develop projects in which theory and film intersect and in which cinematic representations of history and society are investigated. 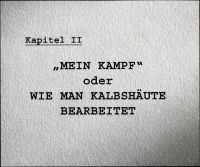 In the context of „Der Standpunkt der Aufnahme - Point of view“ they host a program which could be seen as a ghost story of the 20th century in which cinema played a decisive role.